Whether moving to Europe, moving from Europe, back to the UK or within the UK one of the primary challenges for a successful removal is ensuring that our removal vehicle can easily gain access to the front of your property. 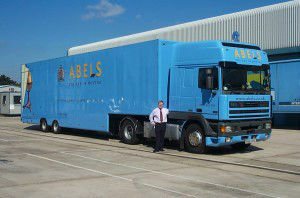 Below is a picture of an Abels removal truck that often runs through Europe delivering our customers possessions. Please look at the image and advise if you believe this vehicle is suitable to gain access to your property. Perhaps only the front of the vehicle would be suitable to negotiate a tight bend – please advise – the benefit of these vehicles is that the front can detach from the rear allowing improved access possibility, but we need to plan the loading of your goods onto these vehicles following your advice. 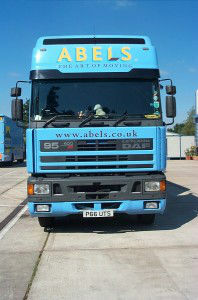 Abels removal truck “road train” pictured against a standard family car. The front part of the truck is 12 metres in length, it will need 4x 5metre (car size)parking bays to safely position outside your home. Both parts together are 18 metres and this is an equivalent length to a 40ft shipping container when brought on a trailer. 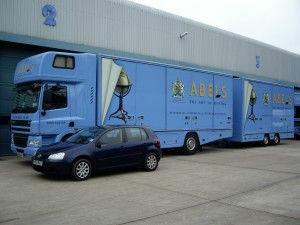 Both parts of the truck together would need 5x 5metre (car size) parking bays to be safely positioned outside your home. Some European moves require a smaller vehicle to gain access into the street where you are, or will be living. When our customers advise that this is necessary we can include within our pricing to arrange with our local partners to supply a small “shuttle van” to move your possessions from our large truck to your property or vice versa. Where we cannot possibly park our removal vehicle within the normally assumed 25 metres from where our truck can park to your front door. Extra time and often additional labour will be required to perform this service. It is normally assumed (unless otherwise advised) that we will be collecting and delivering from a normal house, with a ground and first floor. Please advise us if you live in a property that is all on the first floor or a flat / apartment above this floor – additional time and / or labour will need to be included to perform this service professionally. Where you live above the ground floor and there is a lift available in your building we will look to utilise this facility. Please advise your Abels move coordinator as additional time and / or labour will be required to load / ride / unload the lift during the collection or deliver of your possessions. Please also understand that unless this is a service elevator, or there are multiple elevators available, other residents will often wish to use it whilst we are delivering to you which will delay progress. If the elevator is mirrored / marble or wood walled we will protect them prior to use. Some large items of furniture are simply not suitable for loading within the elevator and will therefore need to be carried up the stairs. In the centre of some European cities, houses are built where access is only allowed / possible / sensible via an outside elevator. This is booked to meet our removal team at your home. We will position the elevator against a window ledge, your possessions will be secured to the elevator platform and then moved up to the window ledge where our removal team will unload and take into your home. Suitable access is needed outside your property to enable the elevator to position in front of your building. Crane – on some occasions an outside elevator is not suitable; the item may be too heavy or large, from a very high floor or there is no access to position the elevator in front of your property and at the window. For this we would employ the use of a crane. This can also be used to collect / deliver items over a house / property where it is not possible to take around due to access; large garden ornaments, shrubs and trees are common when these need to be moved. This does need to be surveyed as there are many health and safety considerations and the potential to have roads closed during the process. Spiral staircases look wonderful but can be a challenge for a removal man. Some items are delivered prior to a staircase being put in, some furniture is glued together when they are assembled making extraction a challenge. Please discuss with your move coordinator should you believe your stairs may be challenging – including 90 degree corners, very steep stairs, thin tread depth, access via outside metal staircase, narrow width. We would normally expect that these should be well lit and properly boarded, with a suitable ladder to gain access which will allow our removal team to enter the area. If these are not in place we would not be able to enter this area and would require the goods to be removed prior to our removal teams arrival. Adverse weather can from time to time effect transport with the road networks closing or causing long delays and accessways being unsuitable for removal men to safely undertake the carrying of heavy furniture and personal effects. Where conditions are so severe a revised delivery date / method would be discussed with you. All our removal vehicles that depart for Europe carry snow chains and a supply of grit for pathways. We do however ask all our customers to advise of any specific local weather problems and to maintain their own driveways and paths to a condition that will allow our removal teams to walk on them safely. Abels removal vehicle, 2.50 metres wide, 4.00 metre tall 18 metre Articulated Removal Truck that is often used on European Removals. 18 metre Articulated Removal Truck that is often used on European Removals. 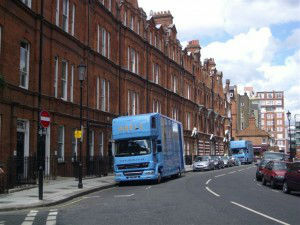 Abels 8 and 9 metre long smaller Removal trucks outside a customers residence in London. 2x 5metre (car size) parking bays have been booked to park these trucks.